THQ says its downloadable Red Faction game will not be expensive, and may even be given away for free. 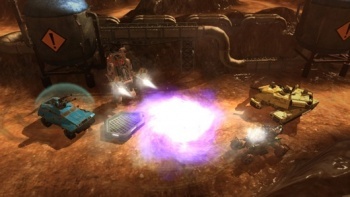 Red Faction: Battlegrounds, a downloadable vehicle combat game that was announced earlier this week, might be given away as a pre-order bonus for Red Faction: Armageddon, according to a THQ representative. The rep said that THQ wanted to keep Battlegrounds' price as low as possible, and that it was one of the possibilities being discussed for Armageddon's pre-order special. Failing that, the rep said, the game would be sold for $5 - $10. Developer THQ Digital Warrington said when the game was announced that the goal was to increase brand awareness, not make a ton of cash, so keeping the point of entry low makes a lot of sense. It won't be the first time that one game has been offered as a bonus for buying another - I still have an extra copy of BioShock on my Steam account from when I bought BioShock 2 - but as bonuses go, a free game is nothing to be sneezed at. Armageddon is scheduled for release in March of next year, and it sounds like Battlegrounds will be coming out at around the same time.